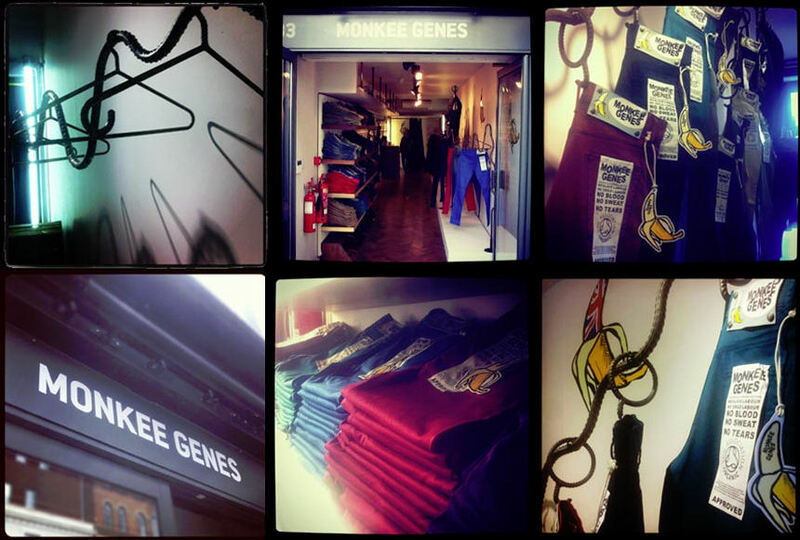 Monkee Genes, the UK based ethical denim brand, have opened the doors of their first stand-alone branded store. Located at The Goodsyard and sat between Shoreditch, Spitalfields and the North of the City of London, Box Park is the world’s first pop-up mall and home to more than sixty carefully chosen fashion brands and food and drink retailers. Boxpark is constructed out of shipping containers called ‘box shops’ to create ‘a place to drop in and hang out. It’s what a real brand experience should be all about’ (Boxpark.co.uk). In addition to retail outlets Boxpark also hosts regular free events from music gigs to art exhibitions. The new Monkee Genes store stocks a collection of fitted styles in a range of denim and organic cotton, stamped with the highest ethical credentials and accredited by the Soil Association and the Global Textiles Standard. The store is the first Monkee Genes outlet offering the full brand experience. Inside you will find Monkee’s new ‘Made in England’ as well as all Autumn/Winter ‘12 fits and colours. In addition you can pick up exclusive T-shirts and collectable, detachable Monkee Genes back labels. The Boxpark store offers a unique chance to get to know the Monkee brand and the complete Monkee range. Expert advice is available in store to help customers find the right fit for them. Monkee Genes are an internationally recognised jeans brand selling throughout Europe, North America and the Far East through a mix of independent outlets, the ‘royal family’ of department stores, concessions in Topman, and online. Monkee Genes prides itself on its ethical stance with regard to child and slave labour and the environment summed up by the company motto ‘no blood, no sweat, no tears’. As part of their ethical commitment they have attained accreditation from the Soil Association and Global Textiles Standard.